Had he lived during the Inquisition, Thomas Jefferson would have been burned at the stake. His ideas about Jesus and Christianity were far from orthodox. A product of the Enlightenment, Jefferson believed that everything, including religion, should be examined in the light of reason. When Jefferson examined the Gospels he came away with a strongly divided opinion. "I find many passages of fine imagination, correct morality, and of the most lovely benevolence," he wrote in an 1820 letter to William Short, "and others again of so much ignorance, so much absurdity, so much untruth, charlatanism, and imposture, as to pronounce it impossible that such contradictions should have proceeded from the same being." As early as 1804, when he was still president, Jefferson began separating "the diamond from the dunghill," as he later put it, to assemble his own version of the Bible. He continued the project in earnest during his later years at Monticello, poring over various editions in Greek, Latin, French and King James English. He clipped the passages he thought were genuine teachings of Jesus and pasted them, in the four languages side by side, onto pages. 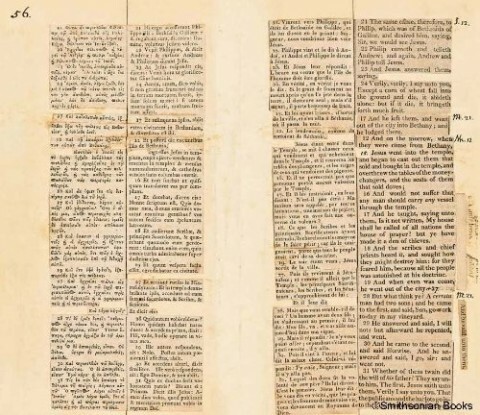 In 1820 -- six years before his death at the age of 83 -- Jefferson produced a leather-bound, 84-page volume titled The Life and Morals of Jesus of Nazareth, Extracted Textually From the Gospels in Greek, Latin, French & English. Jefferson eliminated everything in the Bible concerning miracles. He ended the Gospel story with the execution and burial of Jesus, omitting the resurrection. The retained passages, Jefferson explained in an 1813 letter to John Adams, contain "the most sublime and benevolent code of morals which has ever been offered to man." 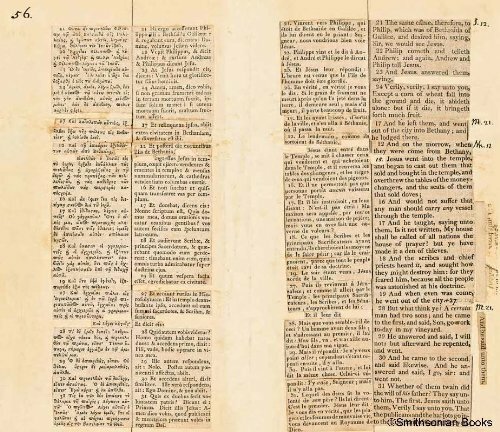 You can examine and read Jefferson's complete 1820 Bible online by visiting the Smithsonian Institution's interactive Web display. 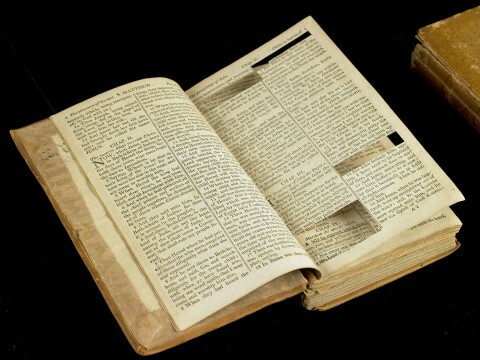 Reproductions of Jefferson's Bible can be purchased online. The images above come courtesy of The Smithsonian. Jefferson was quite an intellectual titan-not like SOME past Presidents! A true Renaissance Man, we need more of them in today’s times. Miracles? Too bad he eschewed them. He needed a miracle to get out of debts… and died in bankruptcy. Also, his slave holding is anathema (he obviously picked and choose what sections he like and what to ignore, so this article is in keeping with who Jefferson is)…whereas Hamilton another believer, eschewed slavery and didn’t compromise his values, though he is often vilified for his believing in a central bank…WHAT HE WANTED WAS NOT WHAT HE IS TARRED AND FEATHERED WITH AS SOMETHING LIKE THE FEDERAL RESERVE. Check out what and why the bank was needed…IT WAS NOT as some would like to portray. Also, his and Washington’s fear of mob rule is well reasoned; they saw the violence and brutality of mobs and believed a culture could operate best with order and safety…THAT IS NOT TO SAY THEY WOULD HAVE APPRECIATED THE encroaching on the constitutional freedoms they worked hard to insure. Lincoln, believed in miracles…also used the Bible liberally and knew it backward and forward, though he was sub rosa and didn’t stuff if down people’s throats…used Jesus’ manner of speaking in parables, tell stories and use humor also; like Jesus, he used wisdom greater than Solomon’s and reverse psychology. If you know the Bible, this is as plain as day…if you don’t, you will miss it, and many have. Seward was even more of a Bible reader and believer…and managed to escape the assassination attempt on his life whereas Lincoln did not. Lincoln was truly a Christ-figure…sacrificed with his blood for the country…but he also said earlier during the war period, rather than to turn around his proclamation, he would rather lose his life. A typical Biblical principle…again if you read carefully. Jefferson was NOT the man Lincoln was…he came from wealth, had privilege handed to him and created the horrors of politics with corruption and division, arrogant and presumptuous, nevertheless, also had tremendous qualities, was a genius, but also a hypocrite and said one thing and did another. Lincoln tried not to…and was most successful as a man at doing it. But…what Jefferson did with the Bible indicates a weakness…he couldn’t swallow the supernatural…something which is HUGE today. Think about it. Why couldn’t he? He believed more in his own powers as a man than in divine providence…an arrogance that is reflected in his behavior with his slaves and with women and with enemies which didn’t know they were enemies because he was duplicitous for expediency sake…and his own. For those who are truly believers, the Bible very plainly says that “nothing is to be added or taken away from the WORD.” For some, ignorance is bliss. Not although together different than today’s “Christians who pick and choose the parts of God’s inspired word that they choose to follow or not. God does not give us the latitude to follow the parts that “we” choose and omit other parts that are not to “Our” liking. Jefferson was not God nor did he possess the ability or power to rewrite the word of God to suit his somewhat twisted ideas. Full credit to Jefferson for trying to make a silk purse out of a sow’s ear, but to this day the best anyone can do in reading “the Bible” if reading it is thought necessary, is to be content with Genesis chapter 1 to Genesis chapter 2, verse 3. Delete all the rest and there’s no conflict, even if one does not believe in literal creation. Leave “god” to his well-deserved retirement and learn to co-exist in compassion and empathy. No one needs a book to tell them how that’s done. If nothing can be added or taken away then we should all learn the language it was written in because translation is not exact, many have questioned certain words and phrases said to mean different things in the times they were written. There have been things added and taken away throughout history. There is no true Bible except the original, original. The King James version was put together by a king who was paranoid, inciting fear, calling innocents witches and burning them but not before he tortured them into confessions. I can’t jump on the band wagon. Holy books are great for causing war. and I know many people who think they have it all sewn up when it comes to God and Jesus and the bible but, they still argue about who is in the know. What Thomas Jefferson did with sissors and paste, untold millions from ancient times through today have done as well; just not quite so mechanically. Many, believers and non-believers, don’t like what the Bible has to say so such passages are ignored or “re-interpreted”. What I think Jefferson realized that escapes many today is that society would be better if people lived by the principles exposed by Jesus even if they deny his divinity and/or the existence of God/god.